4.1 out of 5 based on 155 bloggers and 29 commenters. 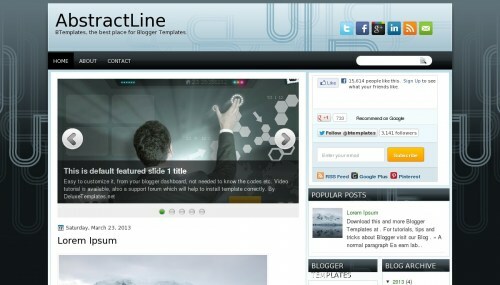 AbstractLine is a free blogger template with 2 columns, right sidebar, footer columns, slider, social bookmarking icons, abstract, gradients and vectorial elements. Excellent template for blogs about any general topic, games or science. where did you get the mashable social widget on the right hand side?? I LOOOOOOVE you blog templates. How do I add the widgets though? Same here bro, i also want to know how to edit slideshow.. I have difficulty to find navigation bar line,, i want to add navigation bar but i didnt find. please help me!! nice blog…!!! and i think ill use this template for others blog. thank you. There are very nice template. I think i use this template in my blog. I wish i use this template in my blog. Thank you very much for this template. the baby shower party is very important for the parents to celebrate because the women spent very hard time in pregnant time and the husband wants to share the pain with his wife for this purpose the celebrate the baby shower party. i love this template going to use it for my few blog. thanks for your work. Hi! does anyone knows HOW TO INSTALL SLIDESHOW?? I’ve installed this template, but i haven’t found any slideshow after installation..
I’m new in blog editing..
1.After downloading Template file,extract it. 3.open blogger and layout and add gadget(html/javacript) and then copy above code in body and save it. Yes That’s it..You can change images/text in code as your wish. how about licenses for this template?